For the third time in a row, the Audi Sport ABT Schaeffler team has won the Formula E race in Mexico City, after a breathtaking manoeuvre in the last second. The Audi Sport ABT Schaeffler team has won the E-Prix in Mexico City. 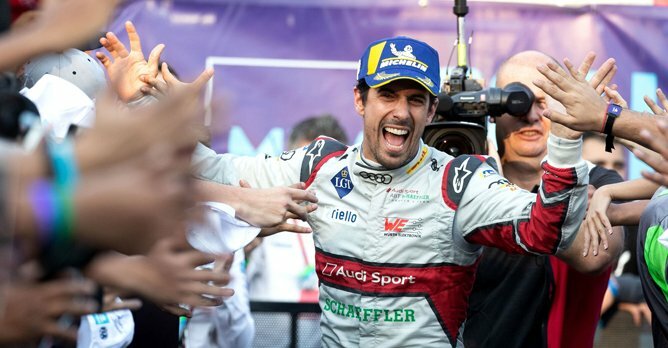 In front of packed grandstands at the Autodromo Hermanos Rodriguez circuit, Audi driver Lucas di Grassi notched up his ninth Formula E victory with a spectacular photo finish after a breathtaking manoeuvre in the last second. Audi Sport ABT Schaeffler's spectacular win in the Mexico E-Prix also marks Lucas di Grassi's ninth Formula E victory Contributing to the triumph in Mexico was the efficiency of the fully electric Audi e-tron FE05 in a gripping and turbulent race. While his closest rivals had to conserve energy in the fight for victory during the final laps, the Audi driver was able to continue to attack and overtake the leading Mahindra, driven by Pascal Wehrlein, with a stunning overtaking manoeuvre just before the finish line. Previously, the Brazilian had already taken second place from Nissan driver Oliver Rowland. Thanks to his first win of the season, di Grassi now moves up to fourth overall in the drivers' standings of the ABB FIA Formula E Championship. Audi Sport ABT Schaeffler defended its fifth place in the teams' classification after four of thirteen rounds in the fully electric race series.